Ask anyone who knows what they’re talking about – go to any conference on Purchase to Pay and you’ll hear the same thing: The biggest challenge to making P2P work is the disconnect between finance and procurement. I’ve commented on it many times. There are fundamental differences between the way finance and procurement see purchase to pay and getting alignment is not straight forward but there’s another reason why, for some organizations it is a challenge and that is their organizational structure. To someone in an functionally structured organization, it doesn’t seem unusual. Indeed, if you are used to working within a functional silo, to operate in a matrix environment would seem daunting. How can you serve two masters? How can competing priorities be managed? In contrast, those that operate in matrix organizations view siloed businesses with some disdain. The term “silo mentality” is never used as a compliment. But sometimes, silos are sensible or at least non-negotiable and when that’s the case, the task of implementing P2P is especially challenging. Back to basics – what does matrix management mean? This isn’t as simple a question as many would have us believe. If you operate in a silo and you have never been in a matrix organization, it can be a difficult to fully appreciate what working in a matrix environment means. To understand the P2P challenges it’s important to understand what a matrix organization is and what matrix management is all about. A good example of a matrix structure is a cross functional project within a siloed organizational structure. Think of a rebranding project that affects all parts of a business across all of its functions: HR, Finance, Procurement, Marketing, Product Development, Sales etc. Within that project, team members have a dual allegiance – to their functional leader and also to the programme manager. The project can be represented as a horizontal structure across vertical functions with stakeholders in the intersections. Matrix management within a functional structure where strict command and control management styles are the norm presents a series of management problems. Most notably are problems of communication and decision making and it is this that presents the most important hurdle that must be overcome if Purchase to Pay is to operate effectively across the functional siloes of Finance and Procurement. It should come as no surprise that for Purchase to Pay to be effective it needs to be implemented across the purchasing and finance functions. The clue is in the term “Purchase to Pay”. 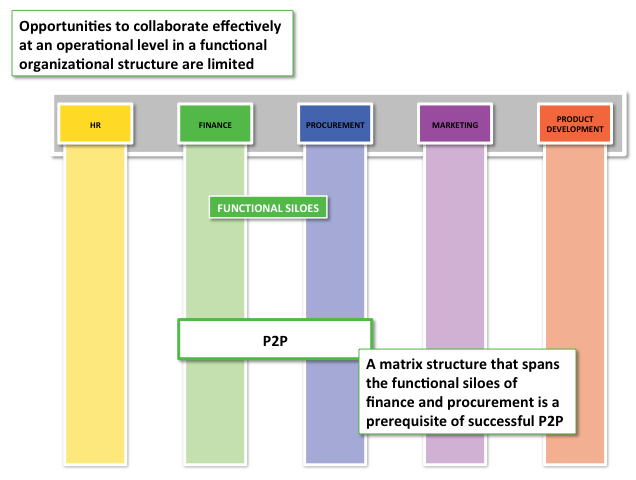 P2P implemented in Finance alone will have an emphasis on the finance aspects. Implemented in Procurement, it will focus on procurement and purchasing. To get it right, a matrix structure is essential but that can be easier said than done. It’s not that easy. Anyone that says it is doesn’t understand it. But neither is it any more challenging that managing in a siloed structure. The challenges are just different. Within a matrix structure, reporting lines reflect the interest of functions or geographies, and these quite naturally, are not always aligned. There is an omnipresent risk of turf wars and battles over accountability. While most people applaud the empowerment of individuals that a matrix structure can foster, the reality is that not everyone is suited to taking responsibility or self-management and managers need to remain attentive to their teams. Not all management styles are successful in a matrix structure. A strict command and control style appropriate in a functional silo is unlikely to be successful. The ability to network, mentor, coach and to facilitate, rather than dictate are key. It is essential to be able to empower people without delegating accountability. KPIs and personal objectives need to be aligned both horizontally and vertically. People should be encouraged to build and strengthen their personal network. They should be supported when they question demands on their time and helped to balance the often competing short term objectives in an open and transparent way so that everyone is fully aware of conflicts that arise. For Purchase to Pay to operate successfully, a matrix structure is a prerequisite. There is no other way. It is non-negotiable. The success of P2P absolutely depends on buy-in to this approach. All stakeholders, leaders and managers within the functional siloes as well as their direct reports, need to put aside the traditional politics that reinforce the boundaries between departments and work collaboratively. Without this buy-in – without the consent to succeed – they might as well put P2P back in its box. Contractual arrangements are the fulcrum point in our opinion.Whether it be customers, suppliers or the organisations(financial) contracts they should come under the control of a ‘legal’ eye (internal or external) and then the cash conversion cycle completed to ensure cash is being received quicker than when its paid out. P2P can only work, in our view, when the demand chain is also fully involved in the process. Absolutely agree with your views on the all too prevalent silo mentality. A common sense of purpose recognised and embraced by all can act as an antidote to help overcome this malaise and all that it brings. “Silo Mentality”, “Matrix Management”, all spot on observations Pete. Something I would add is the lack of cross-departmental communications and many times the total absence of process structure and discipline. In times of BPO to exotic countries and the elimination of local support for essential processes, the biggest stumbling block in P2P to me is that people working for one and the same organization hardly know each other, let alone have ever spoken. 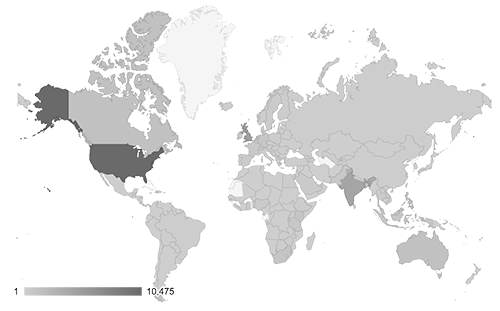 While organization and management was hard in large national organizations, it became harder in multi-national organizations and has become almost impossible in multi-national organizations that have outsourced important processes to external organizations. Don´t get me wrong – I´m not an advocate of turning back time but at some points it would make sense to analyse if all outsourcing made sense and has yielded the benefits it had promised. While accounts payable processes might have been successfully outsourced and centralized (or not), purchasing is still mostly decentralized and local. Finance departments still have local laws to answer to and thus a coherent process structure is indispensable. However, implementing such is difficult and costly. In my experience it doesn´t really matter if a company is working in silos or in matrix organizations. As long as the processes are designed, efficient and distributed across the whole organization and as long as people still know how to communicate and are bound by a certain discipline, P2P will work because every part of the chain knows what is expected. Unfortunately this is more an exception than a rule. Great post Pete and indeed isn’t is highly interesting to listen to a P2P discussion from different point of views such as procurement and finance. What I have learned the past years is that “purchase” might limit the discussion to a PO/non-PO discussion – an important one but one that might miss the origin, sourcing. Not including sourcing/contracts of different kind and the different views on that topic is unfortunate however not unusual. And with sourcing – and thus S2P – I mean both strategic sourcing as well as the every day sourcing made throughout any organization rendering in purchases of different kind in different ways. Sourcing, procurement, purchase, payment but in all areas I feel the contract aspects are the number one issue. Thank you again for an insightful article. I have been in many projects initiated by either Purchasing or Finance where a representative from the other silo has been invited to join the project. This is a good start, but not a full matrix management approach. I always argue for more collaboration between silos and it starts during initiation of the project where the highest authority of Purchasing and Finance should get together and agree on the goals and level of management support for the project. This is especially true when Finance utilises outsourcing and Purchasing is in house and local as described in Markus Thornburg’s comments above. Excellent post Pete. I have always found that the best way to deliver cross silo projects is to ensure that the project is focused on articulating the benefit that are relevant to each silo and then show the “joined up” picture. The hardest task is always to get everyone to generate requisitions / orders. Succeed at that and much of what follows then becomes straight forward (if sometimes political). Too often, P2P projects try to achieve to much to early, overcomplicate the basics and fail to win adoption. P2P is a journey, not a destination so make sure 100% adoption is first on the list of priorities. Matrix management is culturally important, but John Mardle is on the right track – get the contract right. The break down post Contract, is when the Contract details are not well delivered to the user. Make the contract details transactable, so that during the Requisition to PO process, the contents are accurate. Thus the resulting Invoice will match (then Finance doesn’t need to touch it). “Many procurement organizations work hard negotiating supplier agreements for catalog items, standard services or special discounts only to have requisitioners buy elsewhere because they didn’t know who the contact supplier was, or buy from the right supplier at the wrong price because they didn’t know what the price was supposed to be”.